Now, YOU are the end boss. In most dungeons, you enter as an adventurer and fight your way to the center. There, you defeat the big boss monster and win treasure or something. Well, enough is enough. It's time for YOU to be the big boss monster. It's time for YOU to build your own nefarious dungeon. And it's time for YOU to destroy more adventurers than your fellow boss monsters. It's time to play: Boss Monster: Dungeon-Building Card Game. 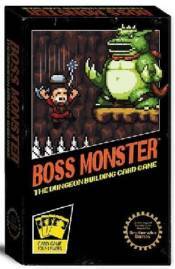 Boss Monster: Dungeon-Building Card Game is rendered in full 8-bit retro glory. Start as the boss monster and build your dungeon one room at a time. Do it wisely, and you will not only protect yourself from wounds but you will also have enough treasure to lure in adventurers. But your dungeons just aren't defensive; they also possess an offensive bite. Build a better dungeon than your competitors and you'll lure and kill more adventurers. Oh, and did we mention the Spells and Level Up abilities that add an extra kick? 'Cause they're there, too! Boss Monster: Dungeon-Building Card Game is THE game for the gamer who always had a soft spot in their heart for Bowser, Ganon, Garland, and Bill (not a video game monster, but a monster none-the-less). - Build the most dangerous dungeon and destroy the most adventurers to win! - Beautifully nostalgic style - with references to 8-bit video games, dungeon-crawling RPGs, and other geeky things. - A wicked evil card game for 2-4 players. - The Game Includes: 155 full-color cards and instructions (in a wicked retro-looking box). - Tools of Hero Kind Expansion Includes: 26 card expansion pack. Adds new Item cards to power-up Heroes with abilities like Cheat Code and Extra Life.